We are delighted to announce that www.droghedaunited.ie has been nominated for the 2008 Soccer Writersâ€™ Association of Ireland club website of the year award. 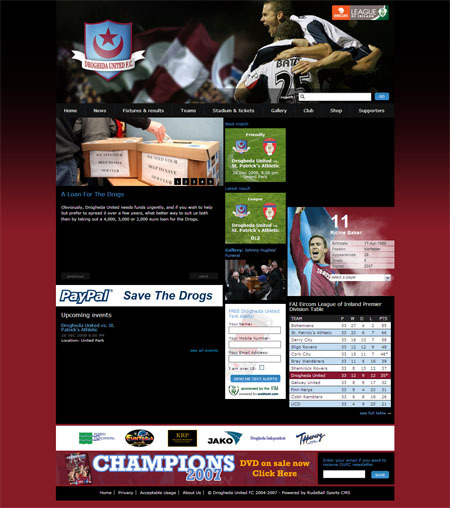 The new revamped site, designed and developed by Spoiltchld, launched earlier this year to amazing support form all at Drogheda United and Drogâ€™s fans worldwide. A busy site with much contribution from fans young and old, it is a hub of activity with updated fixtures and results, club notes and gallery. Also making the shortlist this year is our near neighbours Dundalk FC and the Cork City FC. All of us at Spoiltchild wish Drogheda United the best of luck. Up the Drogâ€™s!